#1 Spring weather. Which hasn't really shown up yet, though yesterday was gorgeous. #2 Angel food cake. I made one from scratch this year for Jonathan's birthday. It's light, sweet, sticky, and delectable. Also, only 130 calories per slice, and I choose to believe that doesn't vary by the size of the wedge I cut. Can't believe there's still some left! #3 Working out. No, really, these days, a good run on the treadmill or a half hour of pilates sounds better to me than sitting in a chair and writing. And I can't even fault myself for it because, hey, writing won't make me live longer or have a stronger heart or trimmer thighs, but exercising will. #6 Laundry. Because we don't have a (working) dryer, doing a load of laundry takes more time and effort than ever before. Which means I get through it slower. Which means there's always a pile to do. And if I put it off 'til tomorrow, that pile will fall over and crush me. #7 Grocery shopping. Again, it's an ordeal because we don't have a car or an elevator. I have to plan carefully what we actually need (no impulse buying! ), bring the appropriate number of bags to carry it back in, and then take forever hauling it all up four flights of stairs. #8 Friends. I will always, always, always put a lunch or coffee date with a friend above my writing goals for the day. This is both because I want the friend to feel loved and supported, and because working from home makes me feel isolated sometimes, and there are days when I crave human contact. #9 Husband. He's just so cute, and if there's a chance to hold hands with him, I'll take it. Even if it means I can't write (because I need hands to do that!). #10 My cat. 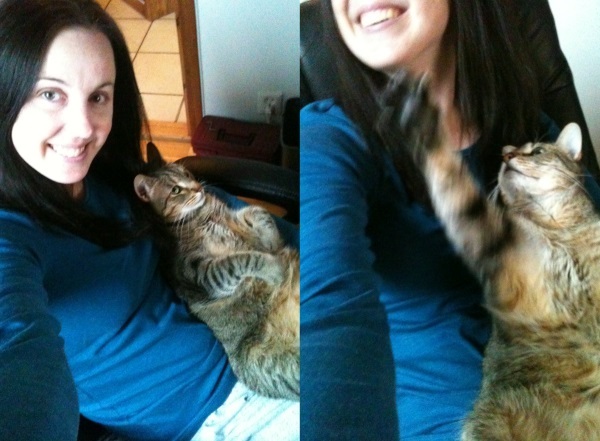 As evidenced by the photo above, my 17-pound animal likes to put himself between me and the keyboard, then reach for my face with his paws while he purrs like a sports car. He puts the Diz in Diztraction!